The Loire is a Queen, and Kings have loved her. It has been the home of Kings since the 10th Century, a spider's web of exquisite fairytale chateaux and a myriad of solid, sturdy castles built to secure regal residency. The Valley of Kings — conjures up images of pyramids, asps, Cleopatra and the silken sands of Egypt, but my most recent trip was not to the Land of the Pharaohs but to the equally sovereign and majestic region of France known as the Loire Valley. 'The Loire is a Queen, and Kings have loved her.' It has been the home of Kings since the 10th Century, a spider's web of exquisite fairytale chateaux and a myriad of solid, sturdy castles built to secure regal residency. These have not only defied the passage of time but remain a living testament of amazing architecture and lavish landscaping. You can hardly look in any direction without seeing a castle. 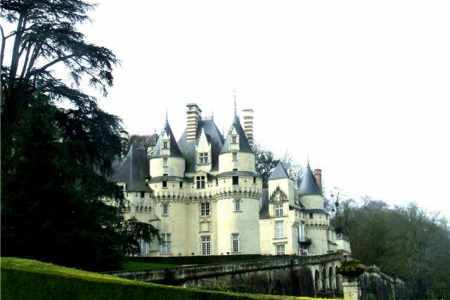 You will lose yourself in the magic and wonder of it all, so much so that the Sleeping Beauty Tower in the Chateau Usse will become every bit as real to you as the monument to the sword swishing heroine – France's daughter of republicanism — Joan of Arc — at Chinon. The sight of so many of these Walt Disney-style castles causes the line between reality and fantasy to blur! Mind you, the excellent wines of the Loire Valley could have something to do with that too! Nine of us set out from Ireland on Holy Thursday... our quest to seek out and explore the Chateaux of The Loire Valley — and maybe exploit a winery or two along our merry way! But at the end of our 5 day stay we had barely scratched the surface of this most sovereign province at France's historic core. We based ourselves at Chinon — booking into the Hotel Plantagnet in the Place de Jean d`Arc; if it was good enough for Kings it should be ok for us! It's a small, quaint, family hotel, run by a husband and wife team with several little enfants running around in pyjamas and chanting 'maman' or 'papa' every morning as we come down to sample the array of fruits, yogurts, cheeses, cold meats and breads that are on display for breakfast. Chinon, on the banks of the river Vienne, was once the residence of Henry II who was King of England and Anjou and was married to Eleanor of Aquitaine who bore him sons, one of whom was Richard of Lionheart of Robin Hood and the Crusades fame. Henry died here at Chinon after being defeated by his sons John and Richard and his wife Eleanor! Talk about a domestic! 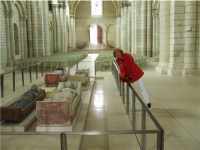 And they are all buried together in the nearby Fontevraud Abbey. Well, united in death, at least! Knowing this I was on a most personal quest to get to the Abbey. As a child I read everything I could lay my hands on about Knights and Round Tables and Crusades and, of course, everyone remembers the tall, distinguished, terribly handsome man who returns from years at the Crusades to find his loyal vassel Robin Hood (or to give him his proper title The Lord Locksley), trying to hold his kingdom for him against the avarice advances of his brother John. Ah, they're not making films like they used to — or indeed men either for that matter. Do or die, I was on a crusade to the Abbey whilst the rest of my entourage were content to sip French coffee at a lovely little café at the entrance to Chinon Castle. This impressive fortress just oozes history; Templar Knights were imprisoned here in 1307, the Amazonian Joan of Arc arrived here at the beginning of her quest to liberate France from the English in 1429, in 1562 it became a stronghold of the much persecuted and maligned Huguenots, and today it continues to dominate the Chinon landscape as a major tourist attraction, much the same as the afore mentioned Joan of Arc. 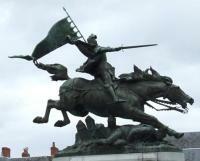 This amazing girl, who claimed to have heard Voices from Heaven telling her to raise a French army to conquer and expel the English — whether Saint, religious fanatic or just plain nutter — she was the founder of French nationalism: with her name reverberating through the centuries whenever Frenchmen needed a battle cry. And she is the ultimate patriot — continuing to work today for her beloved France hundreds of years after her death — attracting thousands of tourists every year who contribute significantly to the French economy. 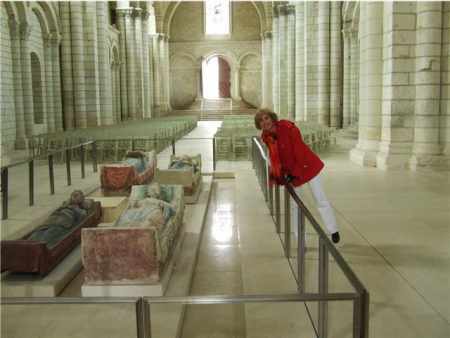 But my hero was still lying somewhere in Fontevraud Abbey. My expectations were high and I wasn’t disappointed. There he was, my White Knight, lying in all his glory beside his mother and father and sister in law Isabelle of Angouleme and looking remarkably well for someone who's been dead since the 12th century. I gazed with reverence at the final resting place of this Icon from the past — Richard the Lionheart — Champion of the Holy Crusade to free Jerusalem from the Infidel — Robin Hood's Lord and Master, and my companions laughed when I pointed out that he was the only one of the four who didn’t seem to have his hands crossed prayerfully over his chest! One hand with the fingers completely worn seemed to be resting a lot further down; significant or not? 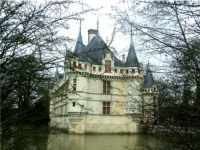 Azay le Rideau is a picture-postcard Chateau — framed beautifully by tall, elegant green trees and mystically reflected in the calm waters of the river Indre which flow all around it. Captivated on sight — we twisted and turned to shoot her from her best angle and she preening prettily before us. Her towers and angles, by the way, were inspired by Philippe Lesbahy who was married to Gilles Berthelot owner of the property and was a favourite residence with the Kings of France for over a century so much so that one of them Francois I confiscated it and sentenced its Master to death — and later offered it to one of his archers as a reward for service rendered. Ah, weren’t those the days when your destiny was at the whim of a King! This chateau is a thing of beauty both inside and out and definitely one for the agenda. Our next port of call was the equally impressive but less charming Chateau Amboise that overshadows all in the quaint little town of Amboise. The day we visited there was an interesting market surrounding the castle and an even more interesting wine tasting in what seemed to be a rather long tunnel leading either from or to the castle. We were each given a glass at the entrance and then off we went on our merryway... to sample at will. Some lovely local wines were on offer if only we hadn’t been flying Ryanair! The Loire Valley produces some of the best Sauvignon in the world. Its pert, crisp whites from the Sauvignon Blanc grape and its light, fruity, medium bodied reds from the Cabernet Franc grape... very pleasant and easy to drink! Hic! At the end of our merry tunnel journey we had our glasses engraved with our names and if you did wish to bring a special bottle home for a special friend you could have the bottle engraved with a special message by a very robust and hardworking engraver who did lovely work for a pittance. A rather novel souvenir. Amboise is austere compaired to Azay le Rideau and definitely more of a fortress than an home — but it was home for a while to one very famous individual, perhaps the most famous of all, namely Leonardo da Vinci. He came to Amboise at the invitation of Francois I and eventually died here in 1519 at the age of 67. Although Leonardo is reputed to be buried here and his tomb can be seen at the Chapel of St. Hubert — but in true Da Vinci style, there's a bit of a mysterious twist... Leonardo was buried in the Church of St. Florentine — Part of the Chateau — however this Church was demolished under Napoleon but 60 years later a complete skeleton was unearthed with a stone inscription containing some of the letters of Leonardo's name. It is this collection of bones that now lie in St. Huberts Chapel. Are they the remains of the Great Master of Intrigue ...or not? 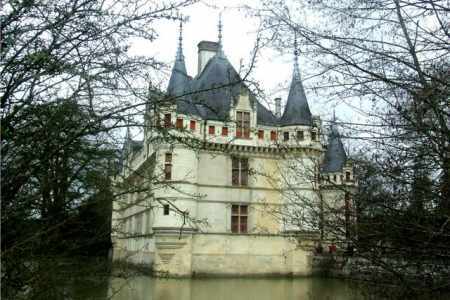 Chenonceau — now heres a real beauty – graceful and decorative from the outside, genteel and femininely charming within. Not surprising, perhaps, when one discovers that this elegant edifice had both in its design and its history a major female input. The very first thing I noticed upon entering the castle was the elaborate, colourful floral arrangements in each room... I'm talking fresh flowers here and I'm talking a lotta lotta rooms and each display was more splendid than the previous one. No reason was given for these aesthetically beautiful displays — I pondered the prospect that they might in some way be connected to the many dynamic women who through the centuries had left their mark at Chenonceau from the original owners wife, Katherine Briconnet, who regularly oversaw the construction of the magnificient chateau to Diane de Poitiers and Catherine de Medici one the Mistress of Henry II and the other his wife. Diane — the Mistress — had the bridge constructed and called after her Pont de Diane and oversaw the planting of the pristine and extensive gardens. Do visit Dianes bedroom and view the large fireplace bearing the initials of Henry and of Catherine — Hs and Cs — cleverly interlaced to look very like the D of Diane. Don’t you just love it? Diane may well have been the Mistress of Chenonceau and Henry but as soon as poor Henry closed his eyes his widow Catherine de Medici lost no time in expelling Diane from the castle and taking up residence herself.. and, sure, who would blame her? She immediately set about putting her own mark on the coveted castle designing — what else? — more gardens! A definite case of anything you can do I can do better! Following Catherines death in 1589, Chenonceau was given to her daughter-in-law Louise de Lorraine and in 1624 another Mistress reigned over the castle... Gabrielle dÈstrees — favourite of another Henry – Henry IV. Another woman — Madame Louise Dupin — saved the chateau from destruction during the Frence Revolution pointing out that it was essential to travel and trade, being the only bridge across the river Cher for many miles — and what bridge would that be — the one and only - Pont de Diane! These women may have been lovers and mistresses but they certainly weren't just pretty faces! And this wonderfully preserved and delightful building remains as a living monument to women who were ahead of their time. What can I say about Usse? Anyone who has ever seen Sleeping Beauty will recognise it immediately. It is a living fairytale, looking up you expect to see Rapunzel appear at the parapet and delicately drop her braided hair to the ground. If you listen carefully you can almost hear the clip-clop of a white Arabian steed carrying a handsome Prince to a waiting Princess. Usse is the stuff that little girls dreams are made of and it transported us back to childhood days of stepmothers, spells and spinning wheels, allowing us to experience with wonder the story of the Sleeping Beauty as told by wax figures in glassed-in rooms around the battlements of the castle. Small wonder that this chateau was the inspiration for Charles Perraults enchanting story and indeed the blueprint for Walt Disneys Cinderella Castle. It is a truly magical castle and to the 'forever young' among you I would say. Do not leave the Loire Valley without seeing Usse … it is pure Fantasyland and isn't that what holidays are all about? 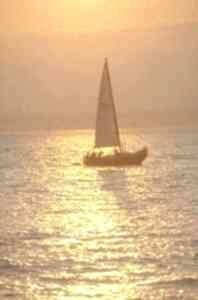 An escape from the banal, the mundane and the everyday? So come on, visit the Loire Valley... for a thoroughly enjoyable break from reality! If you enjoyed reading the above article then you will probably also enjoy Malta by Maria Nolan, and the Netherlands, also in Europe, and our latest articles covering the Orinoco Delta, La Mata, Marbella and Beijing.